Merry Christmas, Scott & Kip! I have written a little festive epilogue to Game Changer! And guess what? It’s free! It’s my holiday gift to you! Join Scott and Kip as they spend their first Christmas together at Kip’s parents’ house in Brooklyn. You can download the ePub file right here, right now! Huge thanks to my wonderful husband, Matt, for his book designing skills. This was a super rush job and I appreciate it! The Game Changers series will continue in March with book two: Heated Rivalry. This will be Ilya Rozanov’s story, and there will be cameo appearances by Scott and Carter Vaughan. I plan on taking the series back to New York for the fourth book in the series, so there will be more of Scott and Kip and the gang from Game Changer in that one. Thank you to everyone who read Game Changer ! It was so exciting to see my first book get published this year and I am really touched by all the kind words people shared about it. They are all very much appreciated. I can’t wait for Heated Rivalry to be released, and I hope you love Ilya and Shane as much as I do! Game Changer is out one week from today! In some ways, it feels like this book has been out for months. At the same time, I can’t believe the release date is finally almost here! It has been a long road to get to October 22. I wrote Game Changer in secret for over a year. Actually, I wrote the first few chapters, walked away from it for a year, almost deleted it, THEN wrote the rest of it in secret for over a year. Most of it was written in the dark on my iPad, when I was able to steal a few minutes while waiting for my sons to fall asleep. Because I had zero confidence about my writing abilities, I decided to write a fan fiction version and posted it one chapter at a time on ao3. I was blown away by the support the story got there. Although I wouldn’t do it again for various reasons, I don’t regret sharing Game Changer as fan fiction first because it gave me the confidence I needed to show it to publishers. Also, I was able to get lots of helpful feedback from hundreds of readers! I am very appreciative to everyone who read and commented on ao3. The final version of Game Changer is very different from what was posted on ao3. It’s very different from the first manuscript I sent to publishers. It’s very different from the second manuscript I sent to publishers. It has been through so many changes and it wouldn’t be even close to the book it is without the fantastic editing by both Caz Galloway at Riptide, and later MacKenzie Walton at Carina Press. I learned a lot during this entire process, and I think I am a stronger writer now thanks to both of them. 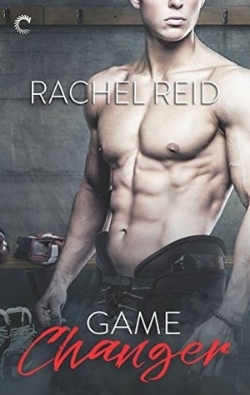 With Game Changer, I wanted to write a cute, funny romance with lots of heat, but also explore the very real problem of homophobia in hockey culture. The Game Changers series will continue that, by checking in on players throughout the league in the aftermath of this first book. And, of course, very happy endings. I am going to be having a local (Halifax) book launch party for Game Changer on November 8. I will post details about that soon. Because Game Changer is mostly an ebook (I will have a limited number of print copies), it’s going to be sort of a weird book launch, but I think it will be fun! Game Changer is out Monday, October 22 from Carina Press, and you can buy it wherever you prefer to buy ebooks. I hope you all love Scott and Kip! I am excited for you to meet them! On Thursday of last week I flew to Toronto to lock myself in a hotel room for four days and work on my two upcoming books, both of which were scheduled to be published by Riptide this year. I was excited to get away from all distractions and just focus on writing and editing. But, of course, during those four days, all hell broke lose in the LGBTQ romance biz, and some very upsetting things were revealed about people who worked for Riptide. It's hard to not feel devastated. I have long been a fan of Riptide and their books, and I, like so many others, had no idea what was going on behind the scenes. I was extremely pumped to have signed not one, but TWO contracts with them for my books. It was a family I was proud to join. So it is with a very heavy heart that I have asked Riptide to release me from my contracts. My dealings, personally, with Riptide have only been positive. They were only professional and supportive with me over the past few months. My editor, Caz, was especially awesome and she definitely made Game Changer leagues better than it was. Wherever the book ends up, I want to make it clear that her editing was fantastic and led to some significant changes in the manuscript that I am grateful for. That said, I have decided that I can't stay with Riptide. Game Changer is the first book in what I have planned to be a four book m/m hockey romance series. It had a planned release date of July 9. The second book (tentatively titled Heated Rivalry), was scheduled for release with Riptide in December of this year. I am hoping to find a new home for the series ASAP, or I will self-publish. My husband happens to be a professional book designer, so I definitely have an advantage there. I'm not sure I have the time on my hands that I would need to promote and market a self-published book, though. I'll look at all of my options. The last thing I want to say is that I am sad not only because my publishing dreams have been bruised, but because I truly loved the idea of Riptide as a publisher. They published a lot of books that I truly love. I was so impressed with their diverse catalogue. I know there are other LGBTQ romance publishers, and I am sure new ones will emerge to fulfill the need for these stories to be told. I also sincerely hope that Riptide themselves can regain the trust of the community, and rebuild. But mostly I hope that the world will one day be able to read my mushy stories about big ol' hockey players falling in love. Because I really love writing them. Or maybe it was 1992. It was definitely either 1992 or 1993. I swear if I had access to a time machine the first thing I would do is go back to my childhood bedroom (when my twelve-year-old self is not there, obviously. I'm not stupid) and I would locate the dogeared copy of The Hockey Digest that set me on a path. 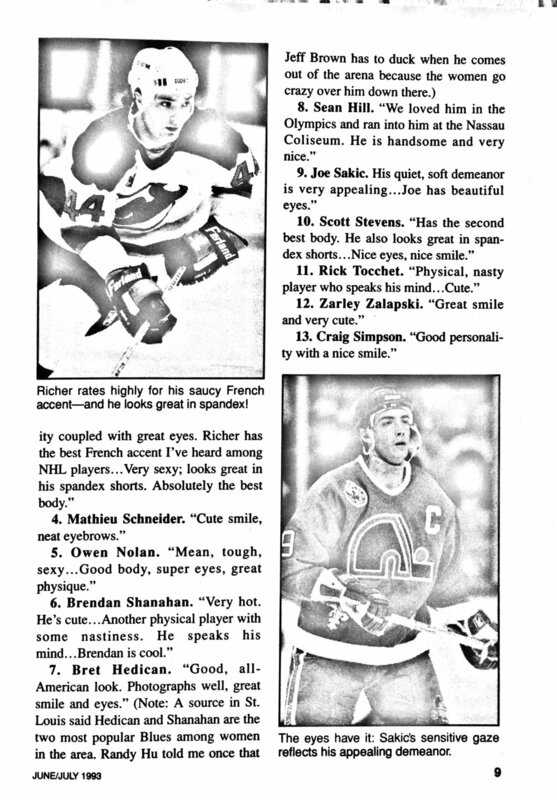 This publication had the GUTS to ask two or three female hockey journalists to compile a list of the best looking NHL players. This was before the internet. Before Buzzfeed. Before it was okay for women to just be openly thirsty as hell. I had been obsessed with hockey for years at the time. Because this was "unusual" for a young girl, I was always careful to keep my feelings about the sport "professional" and "manly". I admired players purely for their skill, their stats, their honour, and, when I was feeling daring, their personalities. But to comment on something as superficial as a player's looks was just...not being a proper hockey fan. 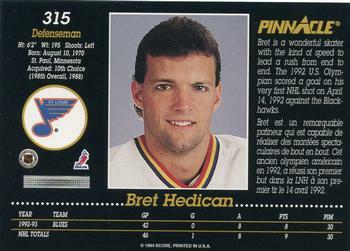 What on earth did it matter if a defenseman had a chiseled jaw, or a rugged cleft chin, or piercing sapphire eyes? Obviously the only thing that mattered was that he was throwing up a decent plus-minus average. But then there was this list. A list written by actual hockey reporters. Female hockey reporters. Women who knew these players professionally. Women who were probably just barely taken seriously by fans, players and the media alike. 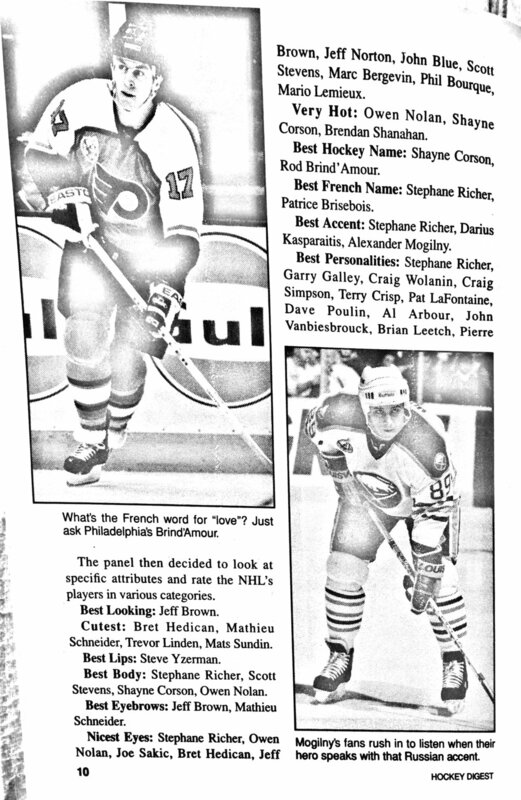 And here they were counting down the best players in the league based purely on how attractive they were. What balls these ladies had! Do you know what that list said to me? It said, "Hey. It's okay. There are some hot men in the NHL and it's okay to admit that. To celebrate it, even! Lusting after these men does not make you a less knowledgeable fan. It does not make you respect them less as players." I read that list so many times. I held onto the issue for years, but it's sadly lost now. And as comprehensive as the internet is, I have never been able to find the slightest evidence that the list had ever existed. So I have no idea who the women were who wrote it. I can still remember probably half of the players who had made the list. I wish I could thank these women. I am sure they wrote it as a fun puff piece, but to me it was earth shattering. If anyone can find me a copy of this list, or the names of the women who wrote it, I would be so goddamned happy. This is my white whale.